"Welcome to Opening Day 2014"
Matt Vasgersian announced the start of the 2014 season as the Toronto Blue Jays began the quest for the pennant away from home at Tropicana Field in sunny Tampa, Florida. R.A. Dickey looked unhittable through 7 innings, giving up 0 runs with just a handful of hits. The Toronto offense was struggling, managing just 1 run through those 7 innings and not providing R.A. with very much support. 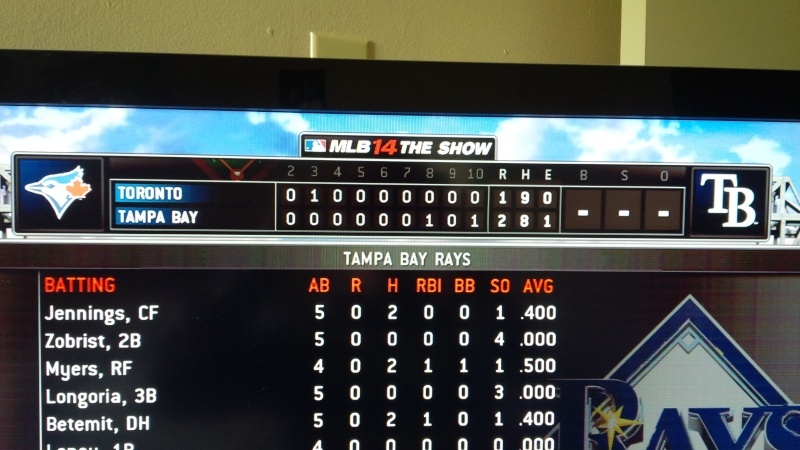 Steve Delabar came into the ballgame to start the 8th inning and proceeded to walk 2 batters and give up 2 base hits as the Rays tied it up going into the 9th inning. David Price continued to pitch into the 8th inning and was eventually relieved by Heath Bell who finished strong for the Rays. The teams were still deadlocked as the extra innings commenced and it all ended in the bottom of the 10th, with a bases loaded infield single to give the game to the Rays, 2-1. A fatal USER mistake as 3rd baseman Lawrie tossed to first base instead of stepping on 3rd or throwing home to eliminate the run and grab the final out. Early season jitters were the cause of this game, both teams look forward to game #2.